Callaway, the #1 selling iron brand in the US in 2017, has unveiled its most advanced and technologically precise irons ever with the launch of Epic and Epic Pro Irons. All created from the same DNA as the GBB Epic Drivers, the #1 selling driver in the US in 2017, these products bring together a wealth of ground-breaking technologies and industry-first engineering processes that optimise every important performance ingredient – ball speed, distance, forgiveness, accuracy, control and feel. Boasting a host of premium, precision-milled and robotically laser-welded components to give pin-point control over CG location, COR, MOI and vibration control, Epic and Epic Pro Irons are the result of an exhaustive ‘innovation without boundaries’ R&D project involving 70 Callaway design and engineering specialists. At the heart of each head is a high-grade, lightweight and strong cast-steel Exo-Cage construction that stiffens the body, particularly in the top line and sole, allowing the face to take on more impact load, in turn generating faster ball speeds, more distance and enhanced performance. A next-generation 360 Face Cup is another key ingredient to unlocking extra yards throughout each set. Featuring an ultra-thin rim around the perimeter of the inner side of the face, at impact it flexes and rebounds to add ball speed on centre-hit shots, while minimising loss on off-centre strikes. The CG position in each head is precisely and individually managed via a new Metal Injection Moulded (MIM) process that utilises a dense, and heavy, tungsten powder baked into intricate Internal Standing Wave shapes that are unique to each iron. This ground-breaking, industry-first process allows the CG to be exactly positioned from club-to-club, (in the 3- to 8-iron 30% of the total head weight is located in the Internal Standing Wave alone) making long irons easy launching and high flying, and shorter clubs more controllable. The Epic Pro Iron benefits from all the technologies of the standard Epic Iron in a slightly smaller head, slimmer top line, and less offset to promote a premium forged-like feel and workability that better players desire, without any loss in performance. 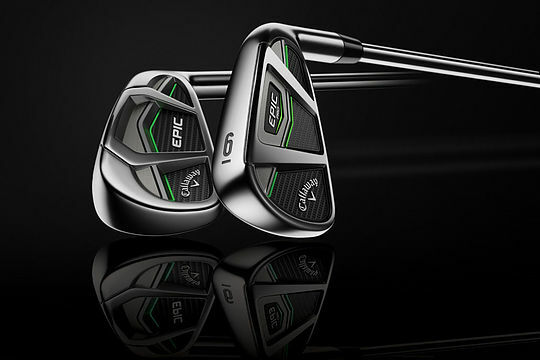 Epic Irons are available 3-PW, with optional AW and SW, right and left-handed, Rifle Project X LZ 95 steel shafts or UST Mamiya Recoil 760/780 EX graphite shafts and Golf Pride New Decade Platinum grips. Epic Pro Irons are available 3-PW, with optional AW, right and left-handed, Rifle Project X LZ 105 steel shafts, and Golf Pride New Decade Platinum grips. Irons will be in store from June 23, 2017.